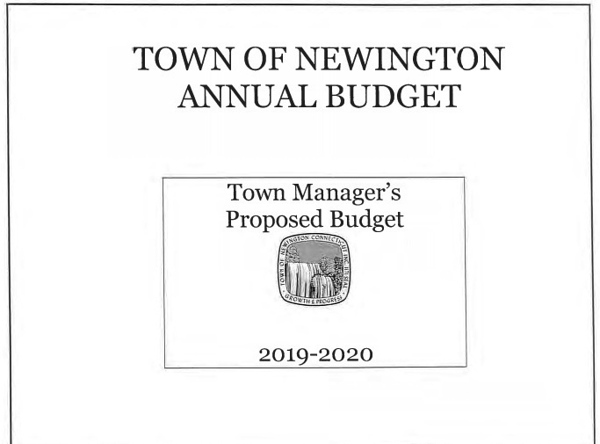 NEWINGTON - Elected officials are now considering a 4.7 percent increase to current spending, as proposed in the Town Manager’s 2019-20 Budget. Tanya Lane presented the $124.2 million proposal to the Newington Town Council at its last meeting. That includes $74.98 million for the Board of Education. Councilors are working on streamlining each department’s request before approving a final budget mid-April. The mill rate as currently projected would increase 1.16 mills to 39.66. This would represent a $171 tax increase for the average homeowner, with property valued at $147,000. The major drivers of the spending increase are a raise in the town’s annual pension contributions to employees, contractual wages, an upsurge in tips for trash collection and a change in the town’s Capital Improvement Fund. While CIP building projects historically total $6.3 million annually, the goal is to transition CIP to a targeted 5.8 percent of the budget. The CIP plan includes $2.5 million for the Town Hall/Community Center Renovation, as determined by the building committee planning the project. Among other items are equipment replacement at the Fire Department; park, pool and playground improvements, and road resurfacing. The total CIP contribution is $7.073 million. The Board of Education requested a 3.26 percent increase in funding, which Lane cut to 3 percent. Board members are hoping to fund two new positions, an English Language teacher to accommodate the growing ESL program and a reading interventionist at the high school. Lane pointed out that the town is expected to receive a $2.49 million increase in state aid this year, or 7.6 percent more than last year. That is still an estimate at this time. “This is only a proposed budget and we still run the risk of that number decreasing by the time it passes, long after we pass our town budget,” she explained. Only one resident spoke at a public hearing on the proposal, thanking staff and councilors for their careful consideration of spending taxpayers’ money. People who have questions about the budget can email town staff at BudgetQuestions@newingtonct.gov. A summary is available on the town’s website and full copies of the budget proposal can be found at Town Hall, 131 Cedar St.n in the Town Manager’s Office or the Town Clerk’s Office. The council is expected to vote on its tentative budget at a special meeting this Monday, March 25, at 7 p.m. in Newington Town Hall. Its regularly scheduled meeting is Tuesday, March 26. The body is scheduled to adopt a final budget on April 16. Posted in Newington Town Crier, Newington News on Thursday, 21 March 2019 09:03. Updated: Thursday, 21 March 2019 09:05.